I was lucky to capture a little white butterfly when out photographing my favorite lily. The shot below has a tiny flying beetle near the stem of the bud. added later: I think the link I have used may not be the same lily. Mary MacADNski: I loved that the Jean Redpath fit in with this day. The second Youtube is especially good. Mary MacADNski: Thank you, Peter. It is my favorite lily. It's a real beauty and your images are wonderful with the butterfly and the beetle! RIP to Ms Redpath - enjoyed the videos! Mary MacADNski: She certainly was a great talent. Mary MacADNski: I had so many good lily shots but then from another angle - there was the butterfly. Oh, and I just love The Prairie Home Companion! I checked to see if Jean Redpath was in the 2006 movie (which we have) and it appears not. This is a lovely tribute, Mary. Mary MacADNski: She is wonderful. Youtube is full of her greatness. Mary MacADNski: Music Mary too, Philine. More than flowers I'd say. Absolutely superb, Mary - and a butterfly, too! Mary MacADNski: Th butterflies were so special - all within a couple of hours in two days. Mary MacADNski: These are the palest yellow. I have identified them properly on other posts. Wonderful Mary! The butterfly is e real bonus here. Mary MacADNski: I had better lily shots but apon discovering he butterfly, I had to put it here. They really are magnificent flowers Mary, just about at their best I would think. Mary MacADNski: I HAD TAKEN THE BEST INSIDE AS YOU MAY BE ABLE TO TELL. a FEW SCARS ARE EVIDENT. Sorry , Brian. Mary MacADNski: This was a while ago. I waited for Lisl to get back before showing butterflies. Mary MacADNski: I thought all you English people would know her. I believe I have a song of hers about North American Indians with a great tribal beat. I enjoying the singing whilst looking at your image; the two are complementary. The lilies are very pretty. Mary MacADNski: This is certainly not the best shot of the lilies but that butterfly had to come along... I love her voice. 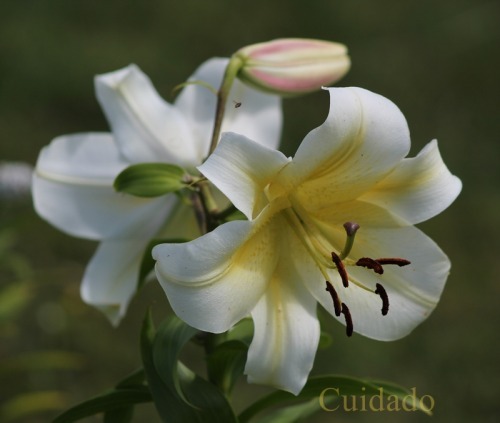 Mary MacADNski: I have picked flowers from this lily already, before the shots. You can see the scars. I got several insects in about an hour - two days in a row. Mary MacADNski: Thanks, Robbyne. They keep coming, eh? This is absolutely gorgeous, Mary. A likey. Mary MacADNski: Thanks, Beverly. The first ones were picked for the table. New ones open up overnight and a fresh one greets you in the morning.